"The robins were everywhere this morning." 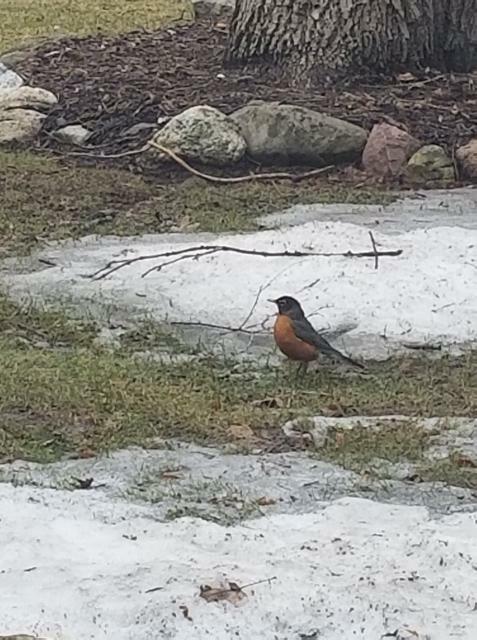 As days get longer and warm temperatures melt snowcover, look for signs that robins are switching from their winter diet of berries to their spring diet of earthworms. When male robins arrive, the first thing they do is claim a territory. Walk around your neighborhood and notice where a robin could find what it needs - water for bathing/drinking, earthworms and insects for eating, shelter from predators, and a safe place for nest building. Keep listening for their territorial songs. Keep reporting and sharing your photographs with our Journey North community! Help migrating birds by participating in Audubon’s Lights Out Program.